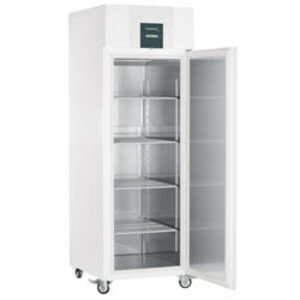 The LIEBHERR Laboratory Freezer with Profi controller is German engineered with high-quality materials, and equipped with advanced functions for the safe and secure storage of the user’s valuable samples and reagents. Samples and reagents can be optimally stored between -10°C to -35°C, and the high-tech Profi electronic controller allows temperatures to be set to 1/10°C accuracy for precise temperature control. Temperature stability and consistency is assured by the dynamic (forced-air) cooling system working in conjunction with the highly efficient compressor, thick insulation and eco-friendly and energy-efficient refrigerant (R 290). Using a hot gas defrost system, the laboratory freezer is designed to defrost less often and faster (in just 8 min) without compromising the integrity of samples and reagents. Visual and audible alarms warn users of undesirable temperature deviations, and an integrated data memory records the last 30 alarm events and one week’s worth of temperature profiles. The freezer is equipped with a keypad lock to prevent temperature and alarm settings being changed without a passcode, and is fitted with locks to prevent unauthorised access. Temperature and alarm data can be transferred to a building management system via RS 485 interface and alarms can be forwarded to an email, phone, etc via volt-free contact for extra security. 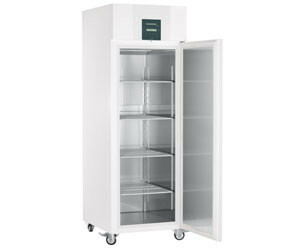 I am interested in LIEBHERR Laboratory Freezer with Profi controller .